No theme park would be complete without a carousel and at Alton Towers The Gallopers fit the bill for circular horse-based entertainment. But nothing is quite as it seems in Cloud Cuckoo Land and here the tradition is turned on its head as the horses have had a bright metalic makeover. 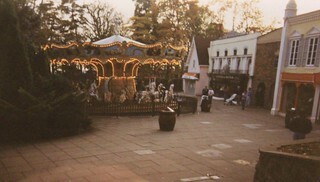 The carousel arrived at Alton Towers in 1991 and was located in the plaza outside Doom & Sons on Talbot Street in the area which would later be home to the great glass elevators of Charlie and the Chocolate Factory. The original rounding boards fo the ride were decorated with images of attractions from around the park and below the canopy were a team of traditional fairground horse, complete with real horsehair tails. 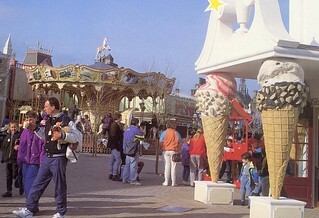 In 1993 Talbot Street became The Land of Make Believe and the area around Doom & Sons was closed to the public so the ride was moved into a more central location and was renamed Gallopers Carousel. This would not be the last time the ride moved and in 1997 The Gallopers relocated to Adventure Land, along with the Beastie. The ride lived here until 2004 when it moved back to Cred Street, in order to make way for Spinball Whizzer. 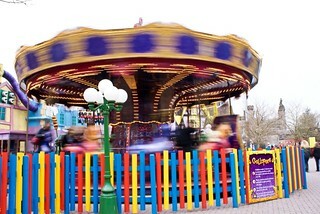 In 2008 the carousel briefly relocated to the hotels as part of The Elves' Playground during the 2008 Christmas event. Over the same closed season Cred Street was transformed into Cloud Cuckoo Land. By the time the ride reopened in 2009 it had gained its current vibrant colour scheme.